I am always a bit hesitant to review a Bible. It is God’s Word and inerrant, not much to review. With Bible reviews I look at the commentary and explanations that make this Bible unique. 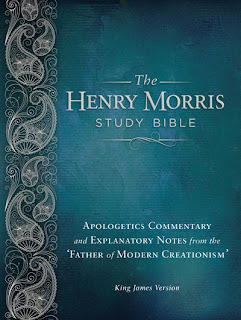 So who is Henry Morris anyway? The front of this Bible says he is the ‘Father of Modern Creationism’. He is the founder and former president of the Institute for Creation Research. A respected ministry leader, educator and scientist with over 60 years of experience in defending the Christian faith. Sounds like good credentials to me!! One of the most distinct features is ‘an uncompromising commitment to literal biblical creationism’. It in other words defends the literal 6 days of creation in its annotations. Much research and years of studying has helped Dr. Morris share with us his insights into some of the difficult passages in the word. Praying that his explanatory notes will help the readers better defend the literal words of the Bible to a lost world. Each book of the Bible is given an introduction as well as an authorship page to give the reader more insight into the times and author of the book. Of course these authors wrote as inspired by the Holy Spirit and not of men. This is a very thorough study bible in the King James version. 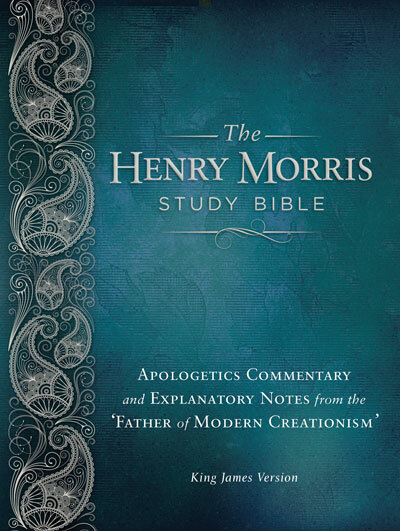 I realize that often times the King James can be more difficult to read and understand, but I actually was pleased that Dr. Morris chose this version as it is more closely related to the original text in my opinion. It may not be the version you carry to church with you each Sunday and Wednesday if your pastor reads from NIV or another version, but it is a good one to delve deeper into the Word with. My 16 year old has been choosing to use this Bible for his morning devotions over the NIV because he likes the depth that it goes into. Weighing in at nearly 4 pounds this Bible is not the kind you carry in your back pocket to pull out for quotes J Fantastic Bible to sit on the table for devotions each morning. Grab those highlighters and pen and utilize this study Bible each morning. It will truly bless your day! I received a copy of this book for review in exchange for an honest opinion. You can purchase a copy at Amazon. Hi Melanie, this is post gives me a better reason to be a Christians. There's no doubt that that you ought to write more on this subject, it may not be a taboo subject but typically people do not talk about these topics. To the next! Best wishes! !